Monitor file system events under multiple platforms in your Java app. Great support. Responsive support team will answer your request within 24 hours. To get help you can choose different support channels: email, support site and forum or premium support service. You are welcome to contact us with initial questions at evaluation support address. * This example demonstrates how to monitor all file system events in a watching folder. Watch for creation, renaming or removal of files and subfolders within any specified folder. JxFileWatcher supports different file system types and always uses the best algorithm for monitoring file system events in a specified watching directory. You will be able to receive notifications about events when access or modification date is changed. You can watch for all file events or just for specified by the event and file filters. The files can be watched inside the selected folder only or including all its subfolders. Be notified about any changes to file size and attributes. These are System, Hidden, Read only and Archived attributes for Windows platforms, and Read, Write and Execute attributes for Linux and Mac systems. JDK (JRE): 1.5 or higher. Java applications which need to monitor folders. For example, a media management application that should be notified when user adds a new media file to a watched folder. Can I use JxFileWatcher along with JNIWrapper library in the same Java application? Yes, you can use it if you include jxfilewatcher-1.4.partial.jar to application classpath instead of jxfilewatcher-1.4.jar. Does JxFileWatcher use file system polling to detect modifications in file system? No, JxFileWatcher does not use this approach. It always uses file system notifications to detect the changes. My FileWatcher listener receives too many fileChanged events. Is there any way to receive fileChanged events only for the particular files? 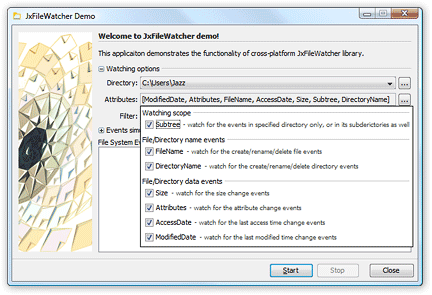 JxFileWatcher reports all file system events to its listeners and number of events greatly depends on the file watcher settings and a watched folder. Does JxFileWatcher support Windows 2008 Server and Windows 2012 Server platforms? Yes, JxFileWatcher provides the support of these platforms. However, in order to enable video capturing ability in JxFileWatcher, you may need to enable “Media Foundation” and "Desktop Experience" features on those platforms correspondingly. Is there any utility in JxFileWatcher so that I can capture the invisible areas of the window? In fact capturing of the scrollable window contents greatly depends on an application itself, so there is no such utility available in JxFileWatcher. Our licensing is based on versions of JxFileWatcher. Having purchased the license for our product you get the right to use the current major version of the product. What are the terms for using JxFileWatcher? There are 6 people on our team, and 2 of them need to use JxFileWatcher. How many licenses do we need to purchase? If we take a developer, working with JxFileWatcher, off the project, can we reassign the license to another developer? How many copies of my product can I distribute with JxFileWatcher included? We have 5 people, who work with JxFileWatcher on one product. Upon the license purchase you will receive an archive with two types of license files: development and runtime. Development license is intended to be used in the development process. Runtime license is to be used for distribution of your software with JxFileWatcher enclosed. We need to look at the Source Code of JxFileWatcher, do you provide it? Yes, you can purchase JxFileWatcher Source Code License; it is provided on a per developer basis. Please contact our sales team if you are interested in this option. If the message gets lost in your mailbox, try searching for an email from JxFileWatcher Evaluation Support with “Your Free 30 Days Trial” subject. Check out the Documentation articles to get JxFileWatcher up and running in no time. Check out the ready-made examples for instructions and ideas on what you can do with your newly gotten JxFileWatcher.